Our health has been wonderful and so has the weather. Will’s been working at getting our gardens mulched and we’ve been weeding ahead of the mulching. But with four big gardens, it’s sometimes a challenge. 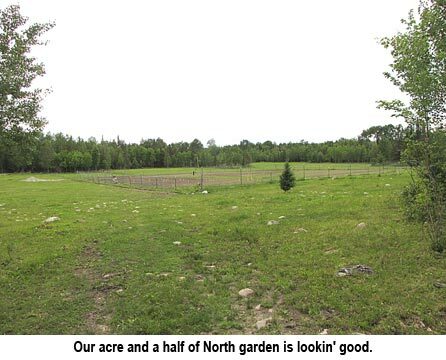 We’ve got the main garden by the house, the berry patch, the old pig pasture, and the North garden so all in all, we’ve got about 3 acres of garden! Between the rain and heat, the weeds are thriving. Luckily, the crops are, too, for the most part. The heavy rain drowned out our corn in the pig patch so I replanted it. Then the ground squirrels dug up the sprouted second crop and ate the seeds. So we put piles of grain on the side of the garden for the squirrels and last evening I planted it again, all 10 hundred-foot rows. It’s Will’s Seneca Sunrise sweet corn, which is a short season corn so we just hope it survives and we have a long enough summer without fall frost, so we can harvest it for eating and canning. No guarantees with this homesteading business! I have to tell on myself. Earlier I planted pumpkins and squash in the North garden. Then I had to have Will come in with the tractor and tiller because the grass and weeds were coming in strong. I pointed out a spot for him to back in to till and he said he thought I’d told him I had planted it in pumpkins already. I couldn’t see any marks so I said “just till it!” He did, after shrugging his shoulders. Turns out he was right. Now we have bean rows with assorted pumpkin plants here and there. I told him I was just planting a three sisters garden (corn, beans, and pumpkins). Oops! 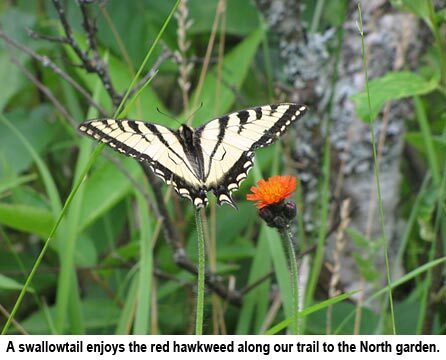 The red hawkweed is blooming and boy, do the butterflies love it! I enjoy watching the yellow swallowtails flit around them. It makes a pretty picture! Thank you so very much! I, too, sometimes cruise back through the blog-years and remember “when”. Sometimes you tend to forget all you got done back then and it’s a good kick in the pants! We got more done than I’d realized….. The birds aren’t eating the crop; it’s the ground squirrels. We’ve found they are basically lazy and pick the corn piles around the field, leaving the sweet corn to grow. Once it’s about four inches high, the seed is no longer tasty and they leave it alone. We also trap them but there are always a few left and they do love the sweet corn seedlings. These ground squirrels are large and have pockets in their cheeks like chipmunks and can pack away a half a row of sweet corn seed at a time. Mittens and the dogs kill some but there are still more. When the corn gets past the tasty stage, we no longer feed them. Hey, it’s what works. So curious about why birds who eat crop seed are being fed with piles of corn or whatever? because that would seem to guarantee that the seed stealing will continue and perhaps get worse as the birds multiply on the free lunches you provide. The birds go for what is easy to get for food or the naturally available food supply won’t sustain the population, in which case the population needs to decline. In the old days when seed was as precious as gold, those birds would have been shot or shot at. I too have seed-eating birds who also also pull sprouted seed right out of the ground. Planted peas 5 times one year and got only a very small crop right before cold weather. Yes, I used to follow all the advice about feeding them so they wouldn’t eat my food crops – no more. Why didn’t you let us know you’d been hurt? A few extra prayers would have helped you heal faster, you know….. I’m glad you’re better and able to get out there and do again. And boy, are you ever right. It doesn’t take the country falling apart to make a big “emergency” in the family seem like the apocalypse! Been there; done that! Good idea but there’s no way I could do two blogs. My kids wanted me to do facebook and I barely handle that. And I wouldn’t want to take anything away from the magazine as it’s been very good to me. So I’ve just had to accept things the way they are and go on. Oh, I’ve tried Skype as Dave Duffy wanted me to do interviews via Skype. I wondered how that would work as my internet is very slow and even videos take forever to buffer. He set me up with it and I wasn’t surprised when the Skype visits were VERY jerky. I’m so happy your “seminar friends” came out to see you. It’s great how friendships can develop, especially homesteading friendships. Miss Jackie and Friends, I too had been thinking it would be great if there were a separate blog from the one here. I had started to say so but deleted my entry several days ago. Keep this one as it is an integral part of the magazine. Jackie is the main reason I am a subscriber and though we have never met personally I consider her a great friend because of her writings. I have followed her for a good many years…. Just a note on stocking up….If I recall Miss Jackie said one time part of the reason for putting so much away is not only if the ” stuff hits the fan”…. but what if a health condition or a disaster precluded much of our normal activity….. Well, in early October 2015 I was out with my dog walking….our cat Mr. Weaver ( from his penchant for weaving in and out of our feet when we walk) came along, unwanted, and was doing his usual. He tripped me. I fell hard skinning my knees and hands and injuring my left wrist, and shoulder and right knee. I called for help no one was near enough to hear me. I had to roll 50 or more feet to a tree to be able to pull myself off the ground….X- ray said no breaks, but a severe wrist sprain. Yesterday my doctor cleared me to begin some light exercise of the wrist. This spring I hired a man to do my tilling and composting and some planting (at a handsome price to him.) My garden is 1/5 or less than usual as a result. 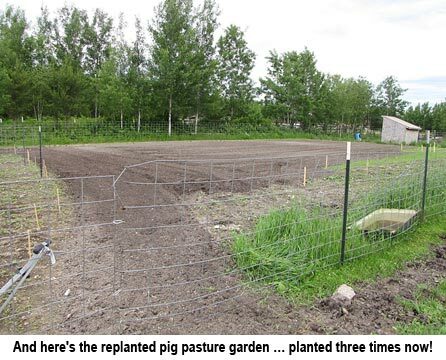 I had tried planting a few things using only one hand, and can say it is difficult to use a hoe or to till that way…..Because I have a well stocked fruit cellar and pantry we will be pretty good this fall anyway. Now I plan to get some things in for a fall crop. I have accumulated everything I need for a fall hoop house and hope to be able to put it in myself or if not to hire the handy man to do it for me. Dear Jackie, I came across your blog after reading all your articles in BHM magazine and was thrilled to find it. I went right back to 2007 and read all your entries from the beginning. It was a wise move – I felt as though you’re taking me right alongside you in your yearly cycle on the homestead, time and time again – starting seeds, planting, breeding livestock, tending the garden, haying, harvesting, canning, splitting firewood and everything in between! I have learned so much from you, and from the readers’ questions you have answered over the years. And your article about avoiding homesteading burnout is constantly before my eyes as I’m taking baby steps on the road to self-sufficiency and try hard not to feel overwhelmed by the contrast between where I am and where I want/need to be. I had also read about your personal trials and triumphs, how you met and married Will, all about your Mom, your family, and more. I had the gift of getting to “know” you – your cheerfulness, resourcefulness, optimism, and your refusal to ever give up, no matter what. This was perhaps the most important lesson of all. Though we are far apart in age, background and culture, I feel we have so much in common: the love of land, nature, plants, animals and fiction writing. If I ever have any spare cash to buy books, yours are at the top of the list. You are amazing. We too have had to replant beans, squash & sunflowers 3 times. I guess it’s that kind of year. I’m glad to know your garden is growing well & your health is wonderful. make a few bucks? We could all invite friends and family to increase the readership. Or perhaps you could have two. The BWHM blog you could do once a week and your private blog you could do a bit more often. we could put our heads together. Not everyone can get to Minnesota to see Jackie so maybe we could bring her to our living rooms. what do you all think?